Most people know distracted driving is dangerous. We know we shouldn’t glance down at our phones to read a text or take our eyes off the road while we search for our sunglasses. But, unfortunately, human nature tends to get in the way of safety. Distractions can be visual, manual, or cognitive. A visual distraction is exactly what it sounds like, it takes your eyes off the road. A manual distraction is anything that causes you to take your hands off the wheel, which can easily lead to a loss of control. Cognitive distractions include activities that take your mind off driving. In some cases, even sinking into deep thought can lead to a car accident. Many states have laws that ban handheld devices, but continue to allow hands-free mobile devices. A hands-free device is classified as bluetooth headsets, hands free car kits, or a personal navigation gadget. According to the National Safety Council (NSC), hands-free devices do not necessarily lower the risk of a distracted driving-related accident. The NSC says that at any given moment, 9 percent of all motorists in the United States are talking on a cell phone, including hands-free devices. Furthermore, about 26 percent of all car crashes involve cell phones, including the allowed hands-free devices. If you are a parent of a teen, you may feel like your child’s face is always angled down toward the screen of a Smartphone. Teens and young people love their phones. Unfortunately, they are less likely than adults to put them down when they get behind the wheel. The AAA says that distraction is a factor in six out of 10 car crashes involving teenage drivers, which is four times higher than even just several years ago. Did you know more people own cell phones than they do toilets? Out of the world’s estimated 7 billion people, a staggering 6 billion have access to a mobile phone. By contrast, just 4.5 billion have access to a toilet. Don’t believe us? Check out this site here to read more. People are addicted to their cell phones, and like most addicts, they don’t know when to stop. Even more concerning, they might not be able to stop. A recent report published shows that around 33 percent of motorists ranging in age from 18 to 64 admit they have read or sent a text while driving within the past month, even though they know it is a crime. Texting and driving is one of the biggest threats on the roads today. Statistics also show that approximately 341,000 auto accidents in 2013 were caused by texting behind the wheel. This number continues to increase every year, despite growing awareness about the dangers of distracted driving and phone use in the car. Safety experts at Distraction.gov say the average driver can safely look away from the road for about two seconds before putting himself or herself at risk of an accident. Because it takes around five seconds to look at a text and comprehend what it says, even glancing down at your phone for what seems like a split second puts you at risk of a crash. One of the most troubling aspects of the distracted driving epidemic is that the fatalities related directly to these accidents are almost entirely preventable. In 2014, the National Highway Traffic Safety Administration (NHTSA) reported that more than 3,000 people died in distracted driving crashes. The numbers were even higher in 2015, averaging eight deaths daily due to distracted driving. Most parents know their young children mimic their parents’ behavior. What they may not realize is that teens – whether consciously or subconsciously – copy what they see their parents do as well. This is especially true when it comes to driving. Chances are, your child sees your driving habits more than any other adult. They learn good (or bad) driving habits from you. Keep that in mind next time you get behind the wheel with your offspring in tow. Distracted driving is not limited to texting behind the wheel. A motorist can become dangerously distracted by eating, engaging with passengers, adjusting buttons and settings on the car’s control panel, and even daydreaming. 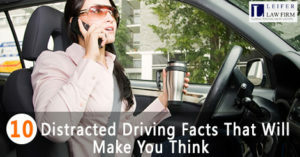 In other words, your phone isn’t the only thing to blame for your distracted driving… . Contrary to popular belief, first place isn’t always the best place, unless you’re driving in the Daytona 500. In December 2012 – just one month – 171 billion text messages were sent or received in the United States. With that fact to consider, according to a recent CDC report analyzing distracted driving in the U.S. and Europe, the U.S. wins, leading the world in distracted driving. If you have been injured by a distracted driver, you have rights. Call today to speak to a Boca Raton car accident lawyer about your case and file for compensation that may be available to you. Our experienced team of car accident attorneys are waiting to help you make smart decisions in your car accident case. We have your best interest in mind, do you?